Two ancient riverside villages separated by a river and joined by a bridge. Since Victorian times, Goring & Streatley has always been a popular holiday destination. Nowadays, visitors come to enjoy its renowned hospitality, the scenery and local attractions. Having a foot in two adjacent Areas of Outstanding Natural Beauty (The Chilterns and the North Wessex Downs) makes Goring & Streatley uniquely placed as a leisure destination for a short holiday, long weekend or day trip. It is a special place for those who want to explore the River Thames and enjoy beautiful and unspoilt scenery, whether it is for boating, walking, cycling, running, playing golf, visiting country houses & gardens or simply enjoying the peace and quiet, then this is the place for you. With a selection of some of the most charming pubs you could find, a lovely riverside hotel, a choice of bed and breakfasts, restaurants and cafes - Goring and Streatley offers the visitor a uniquely English village experience from which to explore the beautiful Oxfordshire and Berkshire countryside. Two National Trails – The Ridgeway and the Thames Path intersect at Goring and Streatley, making the villages a popular stopping off point for those who prefer long distance walks. However the area is equally popular for its countryside allowing pleasant strolls both along the river and on the beautiful hills that bestride the Goring Gap with magnificent views in all directions across Oxfordshire and Berkshire. As a visitor you will be spoilt for choice if you are looking for the perfect picnic spot. Goring and Streatley feature on the Midsomer Murders Southern Trail, offering an ideal place from which to explore many of the Midsomer Murders/Barnaby film locations whilst at the same time enjoying the hospitality of these quintessentially English villages with a great choice of pubs, cafes, restaurants and places to stay. Nearby the Downton Abbey locations of Highclere Castle, Basildon Park, Nuffield Place and Grey's Court are all within easy reach as well as the more well known attractions in and around Oxford itself. It is perhaps unique for two villages situated in different counties to operate largely as one interdependent community. But this is one of the features that make Goring and Streatley a special place. 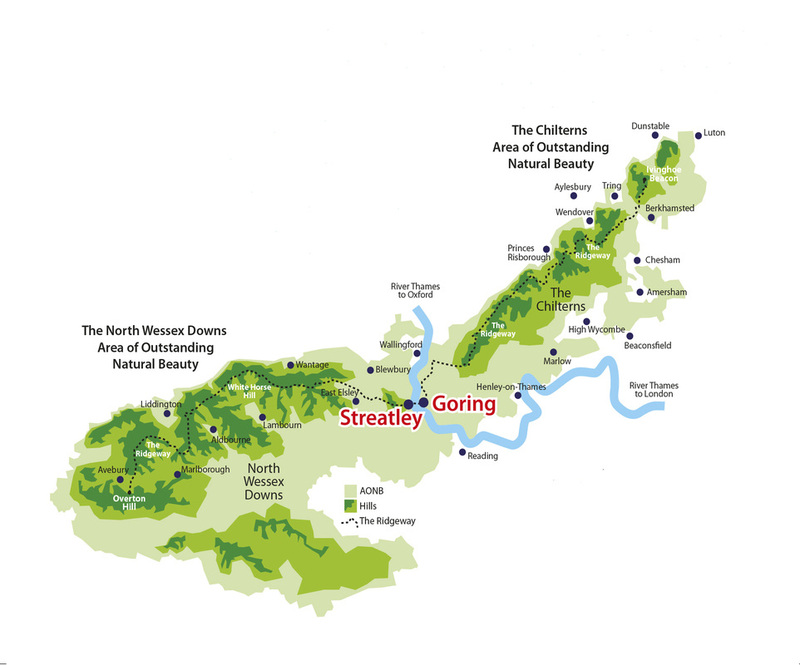 Goring & Streatley have always been special in the geographical sense, as they were the only intersection of three ancient trade routes across southern England (The Ridegway, The Icknield Way and The Thames). They are still the only intersection of two present-day National Trails (The Ridgeway and Thames Path) and part of two other long distance routes, The Icknield Way and The Swan’s Way. The railway station (in Goring) is named ‘Goring & Streatley’ and most of the names of the 150 or so clubs and societies in the villages have the prefix ‘Goring & Streatley’ or sometimes ‘Goring Gap’. Nowadays, as virtually all the shops are in Goring High Street, Streatley residents cross the bridge daily without thinking about leaving Berkshire and crossing into Oxfordshire. It was the construction of the first toll bridge in 1837 which increased the trade and social alliance between the two villages as it was so much easier to walk or ride across the bridge than using the old ferry boat service. Later, with the advent of the railway line and station in 1840, being built on the flatter Oxfordshire side of the valley, Streatley residents had more reasons to cross to the Goring side, which developed considerably as a result of good travel connections to London and elsewhere. 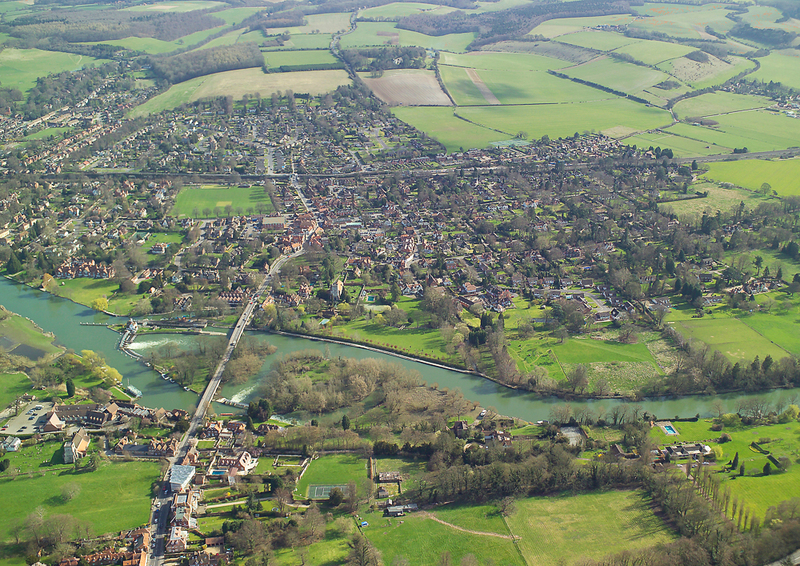 Whilst Goring and Streatley are good neighbours, they are still keen to retain their own unique local identities, traditions and protect their own sense of place that has developed separately over the centuries. The good neighbourliness between Goring and Streatley, however, hasn’t always been the case. In the year 795, our ancient villages, due to the river boundary, were in different Anglo Saxon Kingdoms which were often at war with each other. Goring was in Mercia under King Offa and Streatley was in Wessex ruled by King Ine. By the year 1000 both villages were united in Wessex in the reign of Ethelred the Unready, only to be controlled somewhat separately again after the Norman invasion by William the Conqueror. Peace and tranquillity, however, is now firmly re-established. AONBs are of such distinctive character and natural beauty and considered so precious that they are designated and protected by law (1949 National Parks and Access to Countryside Act and the Countryside and Rights of Way Act, 2000). The Chilterns AONB, is familiar for its chalk ridges, beech and bluebell woods, its many picturesque brick-and-flint villages and scenic drives, is one of south-east England's major recreation resources and extends 70 km from Goring north-east to Hertfordshire. The North Wessex Downs ANOB is one of the largest tracts of chalk downland in southern England. The importance of the surviving downland habitat and ancient woodland is matched only by its archaeological significance. Along with the Ridgeway from Streatley to Avebury are dotted some of the most prehistoric locations in the country, including the Stonehenge and Avebury World Heritage Site and the magnificent, world famous chalk-cut figure of the White Horse at Uffington.